Nigeria's acting president, Prof. Yemi Osinbajo has turned 60 today, March 8th! Even as we thank God for his life and the wisdom He has given to him to lead this nation in the absence of the president, below is all you need to know about Prof. Osinbajo. Oluyemi "Yemi" Oluleke Osinbajo (born 8 March 1957) is the Vice President of Nigeria, in office since 29 May 2015. He is also a Senior Advocate of Nigeria, Professor of Law and until his inauguration as Vice President, a Senior Partner with Simmons Cooper Partners, a commercial law practice. Yemi Osinbajo was born into the family of Opeoluwa Osinbajo on 8 March 1957, Creek Hospital, Lagos. Osinbajo is married to Dolapo (née Soyode) Osinbajo, a granddaughter of Obafemi Awolowo.They have three children together. Yemi Osinbajo was educated at Corona primary School, in Lagos. Between 1969–1975, he attended Igbobi College Yaba, Lagos, Nigeria. From 1975–1978, he studied for his undergraduate degree in Law at the University of Lagos, where he was awarded a LLB Law degree. From 1979–1980 he attended Nigerian Law School. In 1981, he was awarded a Master of Laws after attending the London School of Economics. 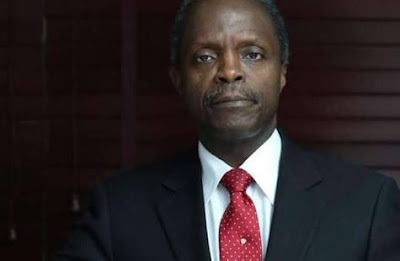 From 1979–1980, Osinbajo served the compulsory one year youth services as a legal officer with Bendel Development and Planning Authority (BDPA), Bendel state. In 1981, he was employed as a law lecturer at the University of Lagos, Nigeria. From 1983 to 1986, he was Senior lecturer of Law at the University of Lagos. From 1988 to 1992, he was an Adviser (legal advice and litigation) to the Attorney-General and Minister of Justice, Bola Ajibola. From 1997 to 1999 he was made Professor of Law and Head of Department of Public Law, University of Lagos. From 1999 to 2007, Osinbajo was Member of Cabinet, Lagos State Ministry of Justice, also Attorney-General and Commissioner for Justice. From 2007 to 2013 Osinbajo was once again employed as a Professor of Law, Department of Public Law, Faculty of Law, University of Lagos. In 2007, Osinbajo was made Senior Partner, Simmons Cooper Partners (Barristers and Solicitors), Nigeria. Osinbajo was also a Senior lecturer at the Lagos State University. Staff Member, United Nations Operations in Somalia, Justice Division, UNOSOM II. Member, United Nations Secretary General’s Committee of Experts on Conduct and Discipline of UN, Peacekeeping Personnel around the globe, Member, 2006. Partner in Law Firm of Osinbajo, Kukoyi & Adokpaye. Senior lecturer at faculty of law, Lagos State University Lecturing public law. you and add many more years to come.